Bad checkpointing and a lack of polish let down the deep sea exploration of Diluvion. An interesting setting let down by frustrating checkpoints and rough UI. What is it? Jules Verne-inspired submarine adventure with deep sea exploration. Diluvion is about drifting through the depths of the ocean in a dangerous, steampunk-inspired setting. In this RPG-infused exploration game, humanity now finds itself desperately surviving underwater, trapped beneath impenetrable ice after a great flood centuries ago. Settlements and towns are nothing more than a collection of haphazard-looking metal structures clinging to glaciers and rocks, in an attempt to not be lost to the deep. You become the captain of your first submarine, and are tasked with building up your crew and upgrading your vessel in an effort to discover the mysteries waiting below, while also having to fight off enemies using your submarine's guns and torpedoes. While the watery depths you explore are a 3D space, when switching to an interior view of the submarines or cities you come across, the 3D transforms into hand-painted 2D graphics. These areas are where the style of Diluvion comes into its own, and the inspiration of Jules Verne is fully felt. These interactive fiction-style 2D interiors are some of the game's most appealing elements, and are a clever way of building out the fictional backdrop. While the crew you accumulate is a bunch of misfits with stories to tell, though, you as their captain are still just some kind of floating presence with little sense of place. There is a thrill in seeing distant shadows and gradually edging closer towards them in Diluvion. The combination of roughly constructed submarines, ancient buildings from before the flood and otherworldly, flowing shapes of deep sea flora make for interesting environments. The discoveries do sometimes lack a bit of scale, however. By the time you’ve gotten close to a mysterious shadow, it often feels a little bit too small in comparison to your submarine to truly dazzle. The set piece ideas are pretty cool, like finding ancient freighter ships delicately balancing above the abyss, or what looks like an abandoned research post atop a giant crab, but they often lack the visual impact that they deserve. Exploration is challenging, and there are lot of things to consider before setting off. Your submarine uses scrap metal as ammo for its guns—run out of scrap and you may find yourself defenceless against pirates and creatures. Your crew requires food, and the larger the crew, the larger stock of rations you’ll need to keep people from starving. Perhaps the most important resource is oxygen, which can only be refilled by docking somewhere. Managing your resources and manoeuvring your crew between various positions within the submarine, FTL-style, adds a satisfying urgency and level of threat. This is marred by the checkpointing system, though. Checkpoints make sense in a game about tension and planning. It stops you from saving at a point which would make it impossible to continue, and it adds to the list of considerations for a submarine captain. Diluvion’s checkpoint system misses the delicate line between tension and frustration, and can be utterly infuriating. Checkpoints are marked by green fish, and at first it seems like every large discovery or settlement will have these creatures milling about, but that's sadly not the case. The game does not save your progress after hiring a new crew member or discovering something significant, meaning that because of the constant threat of death, it is very easy to lose hours of significant progress. Unfortunately, it isn't just the checkpoints that mar the potential of Diluvion. The UI is far from intuitive, and is often unwieldy and ugly. It's a shame, because it detracts from the carefully crafted hand drawn art style. Although there is controller support, too, it feels poorly optimised, often flinging you to parts of the screen you had no desire to visit, and the basic controls feel fiddly. There is a lot to Diluvion—you've got nine different kinds of submarine to collect and upgrade. Once you’ve improved your vessel with hull armour plates, you can reach new depths and access areas that would previously destroy your submarine. You also get an upgradeable home base to house your submarines and standby crew members, so there's plenty of ways to extend the game's life. 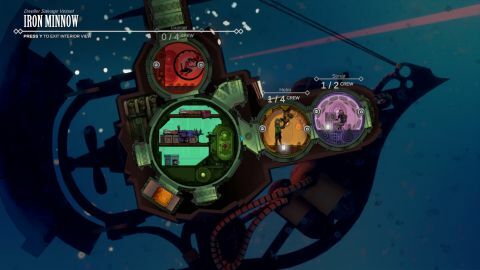 Diluvion's noticeable lack of polish just removes a little of the excitement of exploring the ocean's depths, though, as distinctive as the presentation of this backdrop is.